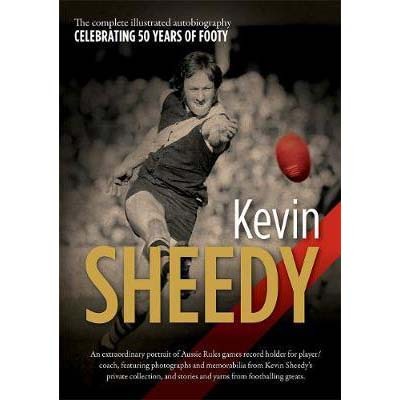 Kevin Sheedy is the biggest figure in Australia’s biggest sport, and has played and coached more games than anyone else in the history of Australian rules. This illustrated autobiography comes on the 50th anniversary of his first senior game, and is an intimate, funny and fascinating portrait of the man, the footballer and the larrikin. Although ‘Sheeds’ won three Premiership flags with Richmond as a player, four with Essendon as a coach, and was foundation coach for emerging powerhouse Greater Western Sydney, he is one of the few footy figures who transcends club loyalties. Loved by all for his colourful ways and fortnight opinions, Sheeds is also admired for his pioneering spirit, for conceiving the Anzac Day game, and for being a passionate advocate of indigenous participation at every level of football. Featuring over 300 photographs, including many from his own private collection that have never been seen before, the book covers everything from his footballing heritage, through all the ups and down of his career, right up to a commentary on footy today. There’s a veritable who’s who of AFL and beyond from more than 20 contributors including Mark ‘Bomber’ Thompson, Ron Barassi, James Hird, Dennis Lillee, Michael Long, Jobe Watson, Israel Folau, Callan Ward, David Parkin, Greg Chappell and many more.